One Saturday in November (predictable bloke already doesn’t know what the date was) C & I fly to Nanjing for yet another entry in Nanjing’s Unofficial International Triathlon, the NUIT. We had many slips ‘twixt on the way, resulting eventually in C’s team consisting of a lady cyclist from her previous employer in Nanjing plus an unknown Swimmer who’d rung the organisers to ask if he could join in, from the outer rings of friends of the same group of staff (two degrees of separation, like). D’s team contained his new best pal, Sean, from hashing, (a mad cyclist) and one of the original organisers, a swimmer from D’s first ever NUIT team. We booked ourselves into the race hotel (my, doesn’t that sound posh) and arrived after lunch on the Saturday to find Sean also booking in, though he’d been in the city a day longer. Investigation of the course(s) appropriate to each went okay and we retired to the hotel for tea. The ‘carbo dinner’ allowed us to mingle and greet – and C met her swimmer but missed any chance to get him to pay his way. The dinner included a well-planned run through details of the race: swimmer starts high on local mountain at 07:00, swims four sides of a triangle for 800m and gets out, to hand over to cyclist. Cyclist runs 1km downhill to bike, leaps onto steed and pedals for 25km with some repetition (and hills) and peels off to hotel. Hands off to runner who goes round a loop three times. Race chip to be carried and times should be automatically recorded. Should. So both swimmers are quite quick. D’s is out 4th, C’s not too far behind. C’s cyclist has not done sufficient equipment preparation and has a slow puncture she knows about but has not dealt with, so after 5-10km has a breakdown she can’t fix and is ferried by car to the next transition point, T2, resulting in C starting the run first. D’s cyclist is as mad as ever and catches the two ‘proper’ triathletes (who’d beaten 10 minutes for the swim, wow) and is chased by Seb, an Aussie with a reputation to maintain on bikes. Sean is 10-20 secs in front at T2, having successfully avoided the dreaded drafting (draughting in Brit English) he so hates being done to him. The trusty bike is not his triathlete's ‘proper’ thing and Seb is a bit annoyed at being beaten by a older guy on a relatively inferior machine. C was given her start when the lady cyclist arrived and is about ten minutes in front. Seb’s runner is the same 10-20 secs (25 secs is 100m) behind and D can hear the following feet hit the road. The runners loop is advertised as 2.85km and is sloping down to the hotel, so the route out is uphill. By the top of the 1st lap D has pushed the margin to 100m and at the turn downhill to complete the 1st lap pushes all the harder as soon as visual contact is lost to try to make the gap grow, Good technique: 2nd lap has other runners a lap behind and people to chase. D catches C on last uphill part of the 3rd lap. So C finishes—only just—4th, caught by the 1st proper triathlete, D’s team smack on 1:30. 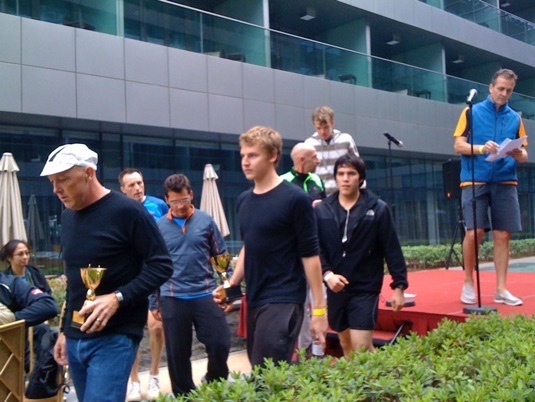 Sean fastest cyclist, D fastest runner. Handsome victory. Helmut by the mike, Sean with the hat, DJS facing the wrong way. Sean packs up after lunch and most of the athletes leave town. D & C change hotels to a hotel beside their old school site in the 1912 district of Nanjing. Hotel proves very nice. We go shopping in the sense of prowling old haunts; not quite boring to see many small changes all over the place in only two years. So to Monday and we visit a small administration office not 400m from hotel. Municipal building, all stone with poor detailing. Upstairs to the relevant second floor office, which deals with marriages and divorces that involve foreigners. The building is undergoing repair or refurbishment and we must pick our way past builders (doozers) working on replacing (presumably) the poor finishes; there is someone playing with a pneumatic drill on the third floor. We have had lots of effort put into raising the right paper, including a trip to Shanghai to the UK consulate for a document that proves D’s single status. The office for the deed has a long, long counter at desk height and three well separated stations. The guy who serves us grabs the papers and whisks his way through them at such a speed one can’t help but think perhaps some of the earlier effort was wasted. 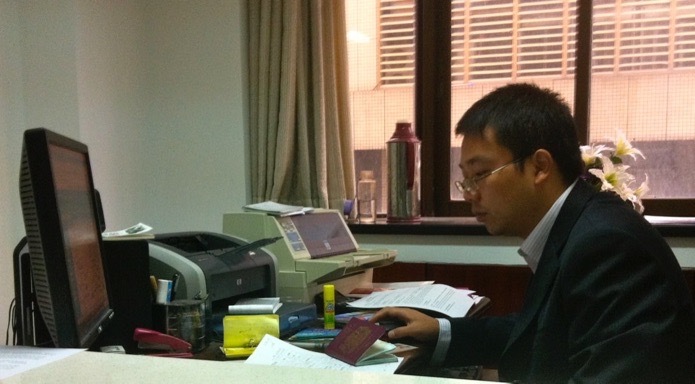 He demands a signature from of us on separate documents and charges us ¥9 – under £1. Then we go see two ladies in an adjacent office. The builders’ noise sounds like a large dinosaur is visiting the dentist and there is no point attempting questions or answers for long periods of time. We are well aware that the official Chinese paper will not quite be acceptable for British purposes so we are unsurprised to be offered a deal for a full translation of the paperwork, which is what the British consulate will then approve and accept for uk.gov purposes. This must be done in Nanjing, being the capital of the province where C is from; getting here is a non-trivial exercise. So the deal is accepted for the rotten thieving sum of ¥700. So described because it is a fair price if the work is done properly. While the dinosaur is swilling his mouth out between drilling phases we double check that the officials understand what is required – and are told to mind our own business (which is exactly what we were doing). Subsequent action by the dept proves that we were right and they were wrong and we will have to do that work again only properly. Message to all: bureaucrats in this country are only out for themselves; selfish and greedy – not corrupt by their own lights, of course, just using their position to advantage. This performance requires yet another photo to be taken, so we are required in an adjacent room. The lady whose task it is to generate photos needs a lesson from C on how to use her machinery (so add incompetence to the list of crimes) and then assistance from all the other women in the office, so I think they’d come to stare. The photo for the marriage certificate must show the couple in the same shot. We came prepared and had done that with some care back in Qingdao. The extra snap was then reprinted from our memory stick and used on whatever extra copies they were messing with. Being served at the same time as us was another couple being divorced. I was expecting to see the appropriate previous and paired photo found and ceremonially cut in twain but no, they have two separate photos taken. Opportunity sadly missed, China me old son. For those who wanted a race of marriages, we can manage that, too. C’s sister did the equivalent deed two weeks later. If you have still not read Chinese Wedding (essay 9), you should. The three-part process of state paper work, photos and reception can be spread across years. 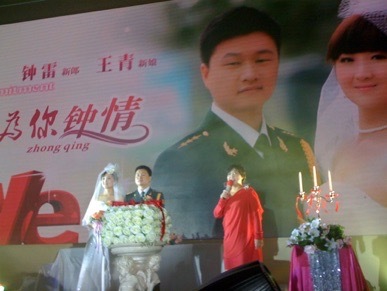 Qing (kiss kiss), C’s sibling, expects to separate the reception into two parts in different cities – we intend to have separate celebrations in different countries, effectively celebrating with guests in turn. In that sense the Chinese are onto something; the recognition by your friends that you have married is a significant step in this society and we do that a different way in the west by doing the whole performance in the one day. Quite what is achieved by the separating of the parts, I am unsure. It means that few couples can explain how long they have been married; it means that the societal demands for a grand function are even larger than the west suffers. The difference, I think, is that the wedding guests in the west are friends of bride, groom and parents, seeing the couple through their moment of transition. In the east there is an element of the red envelope exchange (far too much like passing the wedding presents around endlessly, making the p of present somewhat silent) and far too much required waving of face that demands a huge crowd – we have that too in the west, of course. Q’s Nanjing reception expects to spread to 50 tables, around 600 guests. What did we do about this? Well so far, we let it be known at a Hash meeting and shared a celebratory drink with what amounts to most of our friends inside the hash circle. To my mind, that deals with more than half of our Qingdao friends at one go and with suitable brevity. This essay tells many of those who’re interested what we have done. That is my point, I think: we have done it; we don’t really need your approval and we certainly don’t want to hear any disapproval. Recognition that the event has occurred is up to you and it needs nothing more than registration in your consciousness. Expressions of good wishes are appreciated of course, but in truth they amount to communication of that recognition in a positive way. 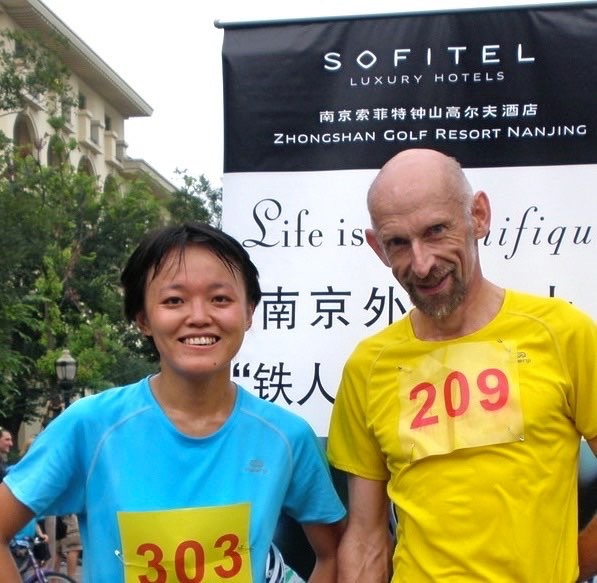 Sean and David went back to Nanjing for that same race in October 2012, which I had thought written about quite some time ago, like immediately. The swimmer we used in 2011 (Helmut) was unavailable, having been grabbed by colleagues at his school. I found—at the third attempt, embarrassingly—that one of our fellow hashers was a competitive swimmer and she, Shannon, went into training, the challenge being to get below 13 minutes for the 800m. Sean was already training hard and I was at the usual barely adequate level. The trip to Nanjing is expensive—indeed, the whole escapade was—so we subsidised Shannon and booked ourselves into the ‘race hotel’. It is interesting to take a bike, however it packs away, on a plane. Sean simply declared it as oversized luggage, collect the billet-doux from ticketing and lugged it over to the right counter; 10 seconds later we’re done and the bike will next be seen at the corresponding counter in Nanjing. And so it was. Sean is good company and the trip was great fun. Shannon had gone ahead to sample some of the delights of the erstwhile capital, rather like Sean had the year before, and we three met up around tiffin time on the day before the race. Being all three of us members of the hash, I’d entered the team as such, Qingdao Hash Harriers, and we, in the spirit of such a label, ordered beer (Tsingtao of course) all round. At which point we meet Helmut, who is also an organiser of the event, and are loudly accused of 'doping before the race'. Of course we also celebrated managing to get to Nanjing without incident with a beer at dinner, repeatedly being noticed as the very few doing such a thing. I’d set Shannon the target of 13 minutes because Sean and I had thought the 90 minute barrier for the whole event was beatable. Sean was annoyed at still being on the No2 bike, due largely to a saddle post sticking, quite immovable, at the packing stage. I’ve only just discovered on the trip across country that Sean is so good at cycling he has a race named after him, having won it by appreciable margins and once by lapping the entire field. Shannon is happy with the last couple of times she’s swum the whole distance, under the target 13 minutes. Indeed, one suspects that each of the three of us has raised their game to meet the perceived expectations of the other two, so there is a frisson of daring in having a beer. The plan is that I’ll meet Shannon as she gets out of the water and do the run downhill to the bike handover, which should gain a minute over Sean doing that run in cycling shoes; I then find a lift to the second interchange while he pedals, taking the baton back from him in what should be around 40 minutes later. It’s not that I’m dramatically faster than Sean—the difference is quite small—but that the shoes have a large effect. The water is cold but picturesque. Helmut is first out of the water (damn) at a little over 10 minutes and Shannon is first female out, really close to 11 minutes and 4th. I’m off like a rocket, moving to 1st in 300m – I do downhill well irrespective of age. Finding Sean was not quite as planned but slick nevertheless, handing him a lead of just under two minutes. [Yes, really]. He made this grow dramatically, being so far ahead that when I eventually cadged a lift, the driver (parent of another runner with the same team idea) refused to believe we’d never caught ‘1st’ in the drive to the hotel, not until Sean came in to the T2 handover an extra 5 minutes clear. My run therefore began as boringly hard work; I met the second and third finishers early on my second lap (so we’re 10-11 minutes ahead at this point) and found many more people to chase down on the third and final lap. Our aggregate time was 1:28 (unless Sean corrects me): Shannon was fastest woman, Sean the fastest cyclist by a lot, David fastest and oldest runner by enough. One run result was shorter, but the runner admitted he’d skipped a lap in beating me by two minutes. My pal Andrew H at Bristol U woudl have been a full 5 minutes quicker over such a distance. We won the race by more than 10 minutes and beat the other relay teams by more than 15 minutes. Which says a lot about the high standard of the ‘individual’ race competitors, the real triathletes. Of course, we had a beer afterwards.